Lots of things have happened since my last blog post…I’m going to try and be better about posting – it’s really easy to fall off the wagon! Kai has built up enough strength to sit up now for a few minutes at a time. I learned the hard way today that I can’t just leave her sitting alone – I thought it’d be okay to run to the bathroom, but she ended up falling over and bonking her head pretty loudly. This resulted in loud crying and general crankiness for Kai, and guilty feelings for me. 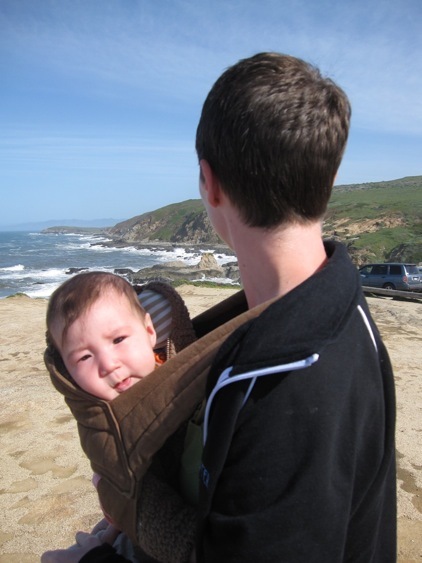 We’ve been on vacation, in California, where Kai had many firsts: first time in California, first time seeing the ocean, first time meeting Mommy’s friends from kindergarten and Mama’s friend from high school, first wedding, first vacation! We stayed in a cabin and spent lots of time outdoors. Kai charmed everybody she met and loved mingling. One woman said that Kai made her ovaries tingly! I love my ring sling. It tastes wonderful. One of the couples from our prenatal class had their baby shower today, which gave us a chance to all be in the same place at the same time. 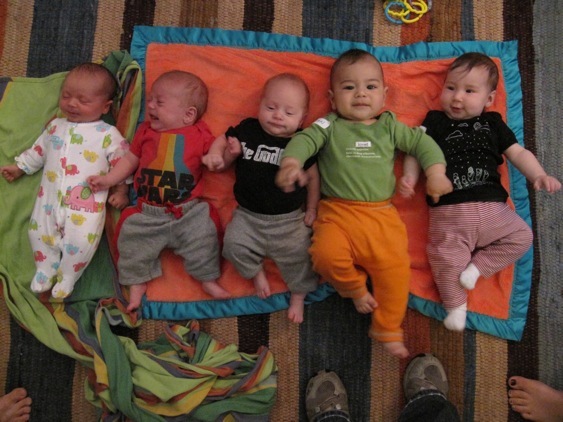 Here’s the latest lineup with the youngest on the left and the oldest on the right…we’re waiting on one more baby! 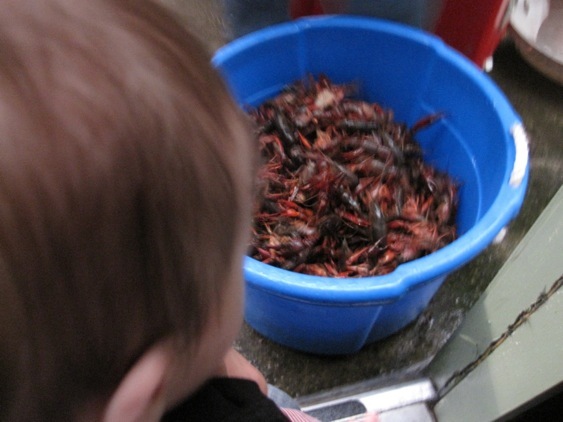 Another first today – Kai’s first crawfish boil! I’m not sure she knew what was going on, other than the fact that we were at a party and there were lots of people to smile at. Life with a baby has been great so far. It’s been challenging, but there is something new every day, and we still can’t stop gazing at her. It seems like she’s changing so quickly these days – she’s really starting to figure out how to get things, get places, and loves engaging with people, dogs and fabric. The bean is enjoying her new ability to sit upright. The bumbo makes her spit up a bit, I think the post juts into her belly at a bad angle. She’s also been watching us cook while sitting in her high chair. Now, if we could only figure out a way for toys that get tossed on the floor to magically get themselves back up on the table/high chair, we’d be all set for a few more weeks. 1 in Vermillion tagged us on this meme. Here goes…I’m A, and Mrs Bean is B. 1A) I’m originally Canadian. I am now a dual US/Canada citizen. 1B) I’m American. I aspire to be a dual US/Canada citizen. 2A) I was raised without any religion by Chinese parents. 3A) I have never had the desire to be pregnant. 3B) I was pregnant. I want another baby. But not now. 4A) I like playing sports that involve maneuvering things with hands or tools, like badminton, softball, basketball (haven’t played this in a while). I want to learn to curl someday. 4B) I try to avoid getting hurt. I hike, do yoga and run. 5A) I like cities, and am attracted to the energy of cities and love wandering around in them. 5B) I love the country. I’d move out to the middle of nowhere if I could. 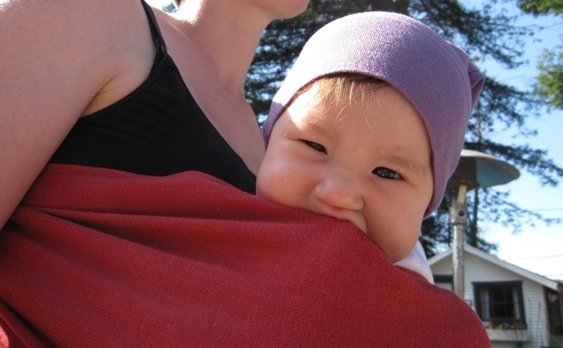 6B) I read about diapers, babywearing and fabric. 7A) I make dinner every night. 7B) I never make dinner. My mind blanks if I need a snack. I wash dishes. 8A) I read sci-fi, fantasy, and attempt to read books I’ve heard about from NPR. 8B) I read young adult fiction, and non-fiction when my brain can manage it. 9B) I don’t obsess over minutiae. Not that sort of minutiae. 10B) I love Geeky Bean. Who shall we tag? hey there, somewhere over the rainbow! The past couple weeks have been full of firsts. 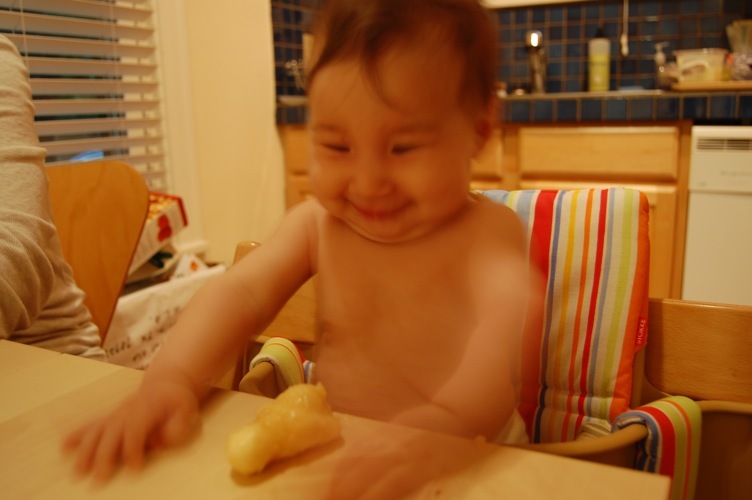 Kai has started drooling like crazy, and rubbing her gums with her fingers. We don’t feel any teeth yet, but they’re coming… Teething tablets have helped with the pain, teethers keep her occupied and we’re going to get some breastmilk icecubes ready. She has started to sit up on her own, for a minute or two. She can gracefully fall to the side or to the front, but we don’t let her fall backwards! 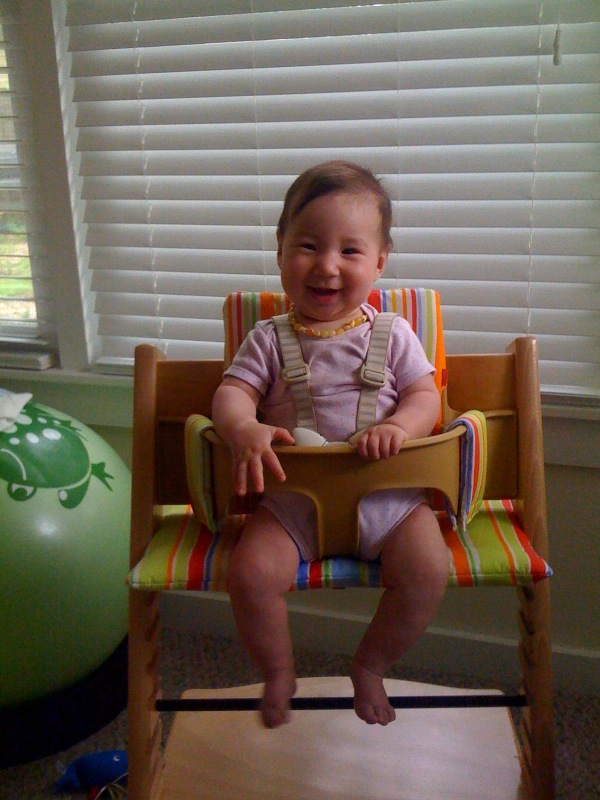 Sitting up means that she can sit in her high chair at the table with us, so we’re getting rid of the swing and bouncy seat…gotta make space since we have a small house. We’re going to spend some time (and money) at IKEA this weekend – it’s time to get things away from the floor and into bins or higher shelves. Kai can scoot on her back now, and Mrs Bean found her under the coffee table the other day, pulling down papers. Other firsts – Mrs Bean took Kai to the local pool for her first swim. I’m sorry to have missed it, but I’m sure the next visit will be much like her first – she looked around in astonishment, then gave the world a giant smile and proceeded to flap flap flap her arms. 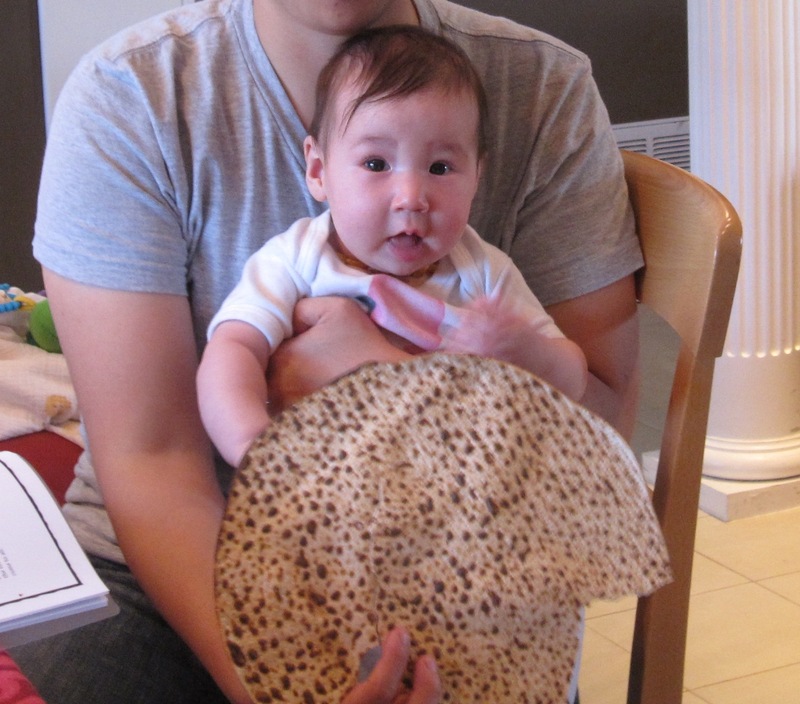 Kai went to her first Passover seder, and seemed to listen attentively to the stories. It was an abbreviated seder – we were home by 9pm, and did NOT drink 4 glasses of wine. Kai has also started ogling our food. She’ll watch the spoon or fork go from the food to Mrs Bean’s mouth, and she’ll sometimes reach for it. She’ll also open her mouth when I open my mouth while eating cereal. 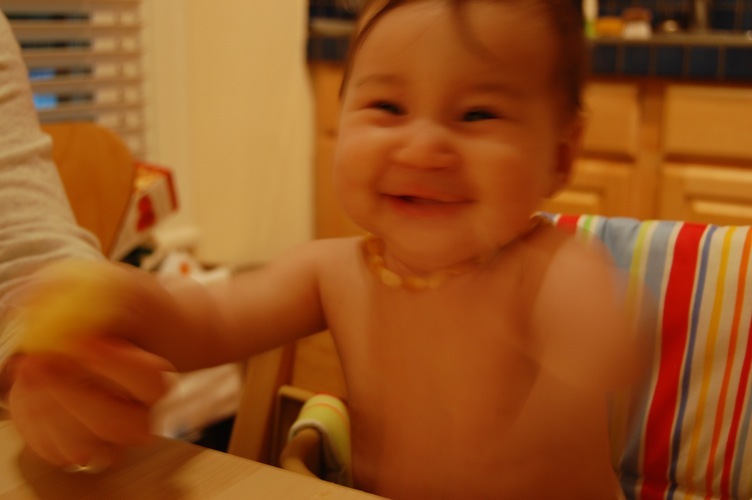 I think she’s going to really enjoy eating food, and I can’t wait to take her on food adventures – the trailers and carts of Austin need to watch out – there is a cute and hungry baby preparing to unleash herself on them!